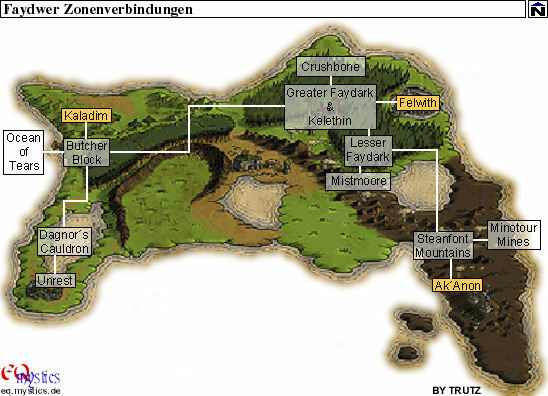 Welcome to Diznitch's EverQuest page! I am a Level 65 Dark-Elf Enchanter on the Tunare Server. Greetings to my adventuring friends Wolfex, Malisse, Kumaelan, Olliwiz, and Nekrom! Hail! My old guild Eternal Retribution has moved on to WoW (ick! ), but is still active. My game notes as of my last active play are online. LUCY -- Spell and item database. 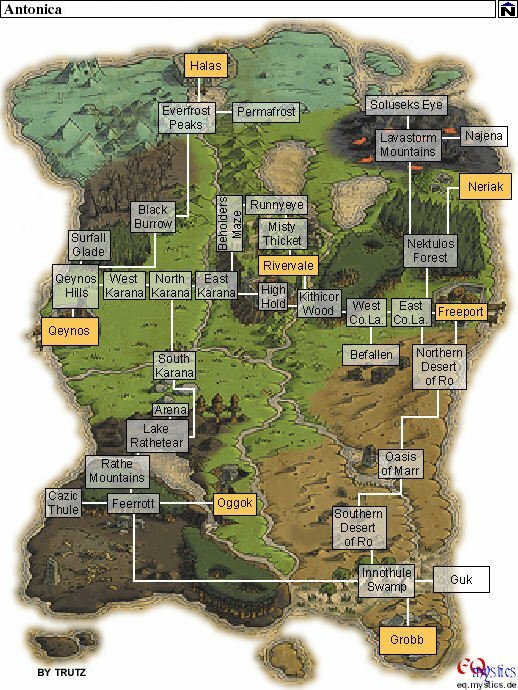 Illia's Everquest Bestiary -- Mobs, zones, and loot. Jewelcraft Tables (ASCII version) -- now with Black Sapphire info. Antonica Continent Zone Map -- (115k JPEG) Show map of all zone connections on Antonica. Faydwer Continent Zone Map -- (62k JPEG) Show map of all zone connections on Faydwer. emotes.txt -- some of the more recent emotes added to EQ. Not a complete list. Diz completes his Epic Quest March 20, 2002! Thanks to everyone who helped, especially Wolfex and ER! The Progress Checklist is still available. Diz hits Level 60 on September 2, 2002! WooT! Copyright © 1999 - 2009 by Matthew Deter. All Rights Reserved. Everquest® is a Registered Trademark of Sony.